Rich countries are to blame for climate change and should take the lead in forging a global climate pact by 2015, a deadline that "must be met," the head of the United Nations said today. 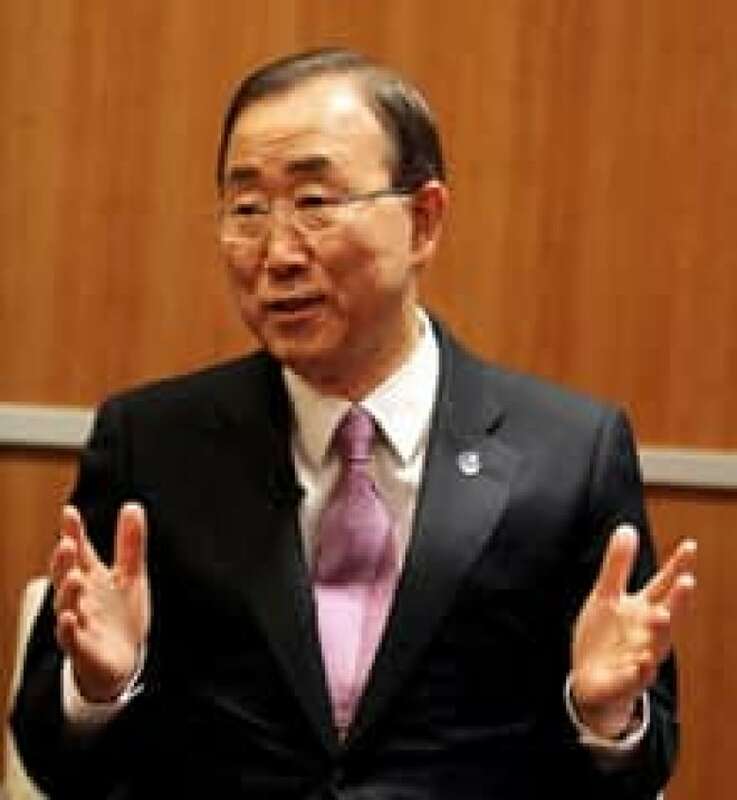 On the sidelines of international climate talks in Qatar, UN Secretary-General Ban Ki-moon said Wednesday it was "only fair and reasonable that the developed world should bear most of the responsibility" in fighting the gradual warming of the planet. Ban's comments echoed the concerns of China and other developing countries, which say rich nations have a historical responsibility for global warming because their factories released carbon emissions into the atmosphere long before the climate effects were known. "The climate change phenomenon has been caused by the industrialization of the developed world," Ban told The Associated Press. "It's only fair and reasonable that the developed world should bear most of the responsibility." Many rich nations, including the U.S. and European Union, say the firewall between developed and developing countries that has guided the two-decade-old climate process in the past no longer reflects the world today and isn't helpful in dealing with the problem. Most of the emissions now come from the developing world, and China has overtaken the U.S. to become the world's top carbon polluter. "Rich countries will need to do more than poor countries, that is clear," European Union climate commissioner Connie Hedegaard told AP. "But all of us will have to do the maximum we can because otherwise we can't cope with climate change." How to divide the burden of emissions cuts is at the core of discussions to create a new global climate treaty that would apply to all nations. The only binding pact so far, the Kyoto Protocol, only covers the emissions of industrialized countries. Last year, governments decided that the new treaty should be adopted in 2015 and enter force five years later. The Doha meeting is supposed to produce a work plan to ensure that the treaty is ready by 2015. "This deadline must be met. There is no time to waste, no time to lose for us," Ban said. "Climate change is happening much, much faster than one would understand," he added. "The science has plainly made it clear: it is the human beings' behavior which caused climate change, therefore the solution must come from us." Ban came to the negotiations in Doha in an attempt to "accelerate the process" of shifting the world to a clean energy pathway, and helping the most vulnerable countries adapt to inevitable warming. 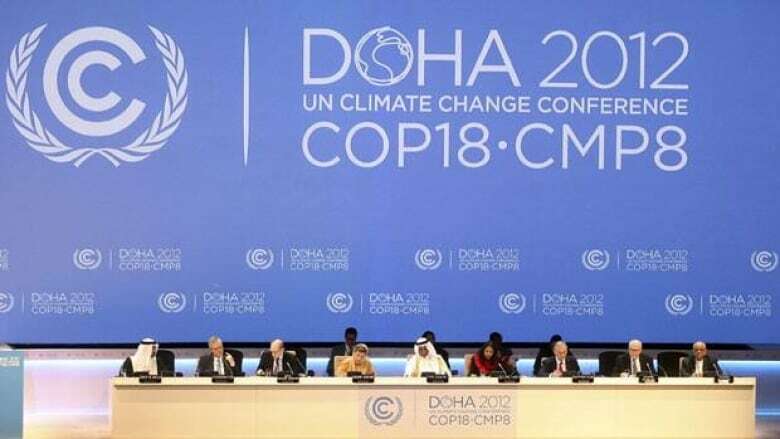 Governments represented at the talks in Qatar are also discussing extending the Kyoto Protocol, which expires this year, as a stopgap measure until the new deal takes effect. The United States never joined the Kyoto Protocol, partly because it didn't cover emerging economies like China and India. For similar reasons, Canada, New Zealand and Japan don't want to be part of the extension, meaning it would only cover Europe and Australia, who account for less than 15 percent of global emissions. Nevertheless, Ban said it is "imperative" that the treaty is extended, because it is "the only existing legally binding commitment when it comes to climate change." Dangerous climate effects could include flooding of coastal cities and island nations, disruptions to agriculture and drinking water, and the spread of diseases and the extinction of species. A small minority of scientists still question whether the warming seen in recent decades is due to human activities, such as carbon emissions from the burning of fossil fuels. On Tuesday, Ban said it was time to "prove wrong all these doubts on climate change." Global warming skeptic John Christy of the University of Alabama said Ban's statement was "representative of a religion, not science." "Science requires questioning (i.e. skepticism) those who wish to stifle debate using arguments from authority (not arguments from evidence)," Christy wrote in an email. In 2010, a survey of more than 1,000 of the most cited and published climate scientists found that 97 per cent of them believe climate change is very likely caused by the burning of fossil fuels.